Sometimes the existence of a new ‘particle’ in physics has been proposed long before it was discovered by an experimentalist in a lab experiment. Some examples of this are the anti-electron (positron) proposed by Paul Dirac in 1927 and discovered in 1932; the neutron, predicted by Ernest Rutherford in 1920, and discovered by James Chadwick in 1932; the pi meson discovered by C. F. Powell’s group in 1947 but predicted by Hideki Yukawa in 1935; and in 2012 a particle was detected exhibiting most of the predicted characteristics of the Higgs boson, which was predicted by Peter Higgs and five others in 1964. For their prediction, Peter Higgs and François Englert, were awarded the Nobel Prize in Physics in 2013. Those predictions, which led to successful outcomes, were based on the established laws of nature; for Neptune it was Newton’s gravitational theory, and for particle physics, the newly developing quantum theory. Then there was the proposal of the planet Vulcan predicted to orbit closest to the Sun, hence the reason for the choice of its name. 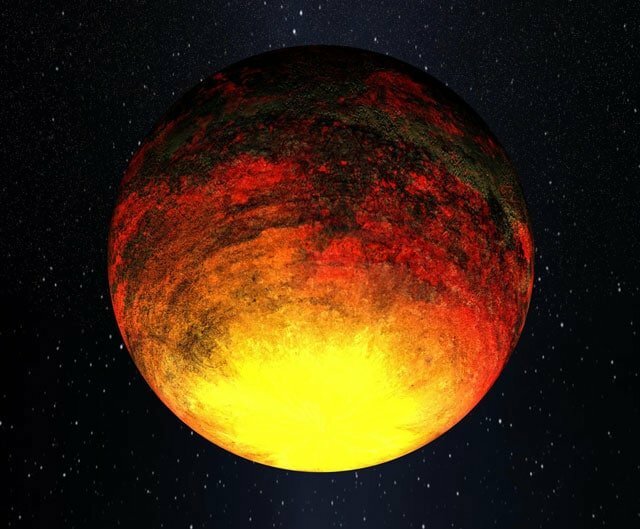 This planet’s existence was proposed because of a certain observed disturbance in the orbit of the planet Mercury, the inner most planet in our solar system. But its orbit had a peculiar feature in that it would always remain out of sight of the earth, on the opposite side of the sun, so it was called ‘dark matter.’ ‘Dark’ because it could never be observed. But its existence was no longer needed after Einstein in 1916 published his General Theory of Relativity and calculated very precisely the needed perturbation of Mercury’s orbit. It meant the physics needed refinement, that is, new physics was developed. This included the Newtonian physics, valid in the regime in which it was known to give correct results, but not valid outside that regime. Once that was understood, no dark matter was needed—the fudge factor was eliminated. It is important to understand that cosmology, despite claims to the contrary which refer to ‘precision cosmology’,3 is not the same type of operational, repeatable laboratory science that discovered the positron, the neutron or even the planet Neptune. In the latter case, it was not possible that astronomers could have sent a light signal to Neptune, to reflect off it. The solar system is sufficiently small though that over some reasonable timescale man can, in some sense, use the solar system as a laboratory. But that is not possible to do with the universe—it is just too large. As mentioned above, proposing the existence of some as-yet-unidentified particle is not bad physics per se. But we need to understand that dark matter, dark energy and other ‘unknowns’3 were only proposed in the standard big bang cosmology to resolve conflicts between the theory and some astrophysical observations. Dark sector components—dark matter particles—are essentially only needed when cosmology is involved.6 The Standard Model of particle physics alone, as contrasted with its application to cosmology (particularly big bang nucleosynthesis (BBN), which is proposed as the source of all light elements7) does not really need them. The motivation is largely from cosmology and the worldview that the big bang is the correct cosmogony8 for the universe we see. In short, the dark sector—incorporating dark matter, dark energy, and now dark radiation—is proposed as an auxiliary hypothesis to rescue the standard big bang model from the inconsistencies presented by observations (CMB radiation anisotropies,9 type Ia supernova data,10 etc). This makes the paradigm particularly difficult to refute, because new physics (in the untestable cosmos), or more fudge factors, can always be added to resolve any conflicts. Cosmologists have used the data from the Planck satellite survey of the Cosmic Microwave Background (CMB) radiation11 to calculate the total mass of the universe using the standard ΛCDM big bang model12 and compared that result with what they calculated using the data from brightest sources in the cosmos, the explosions of stars in distant galaxies, supernovae of the type Ia.13 They found that these different methods resulted in significantly different answers for the mass content and the expansion rate of the universe.2 These discrepancies could be resolved if the missing mass was in the form of some type of neutrinos or some other dark matter particles. As a result it has been proposed to add something to the dark sector—dark radiation—in the form of a relativistic sterile neutrino.1 The proposal is needed for the early big bang universe. Here the dark sector refers to the appropriate domain of particle physics that applies. And the assumption is implicitly made that the theoretical particle physics that is used in particle physics on earth today also can be applied to the alleged past BBN process. 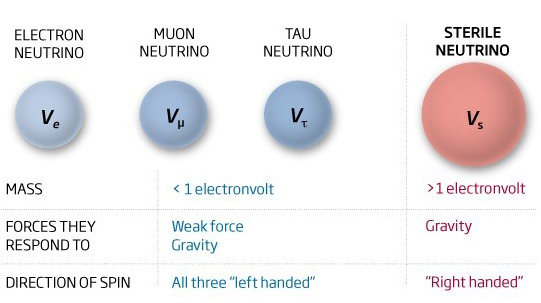 In the Standard Model of particle physics there are 3 neutrino types, called flavours (electron, muon and tau), and it is usually considered that at least one is massless. Once they were all thought to be massless, but the discovery of neutrino oscillations—whereby neutrinos change flavour and that requires their masses be different—implies that at least two of them are not massless. It is hoped that they could comprise some of the missing matter in the universe. However from BBN calculations, based on the known properties of the known three neutrinos, it has been determined that they would make a negligible contribution to the total mass in the universe. The Standard Model precisely predicts an effective number of neutrino flavours (i.e. kinds) and that number is three. Therefore any more than this (i.e. greater than three) derived from BBN represents the presence of sterile neutrinos, or hidden sector photons; particles from the dark side. Thus a resolution of the discrepancy in the mass of the universe derived from the CMB and SNe Ia data is achieved by adding a new dark matter particle—the sterile neutrino, or dark radiation. It is called ‘sterile’ because is does not interact with matter except via gravitation. That is, it does not interact by the weak nuclear force, as do the other known neutrinos. It is another dark component from the dark sector of physics and it is needed to keep the big bang story alive. Here we have a situation where the determination of the mass of the universe and the Hubble Constant from two different survey methods has resulted in markedly different answers. That just should not be the case if the theory is right. So, to rescue the big bang model it has been proposed that there exists a new dark entity—dark radiation in the form of a sterile neutrino. The Standard Model of particle physics is the most successful theory in physics to date. In that theory, there is no real need for this extra neutrino, with bizarre properties such that it does not interact with normal matter like its ‘brothers’ do, hence is impossible to detect in a laboratory experiment. But if hot big bang nucleosynthesis is the true origin of the light elements (like helium, deuterium, etc.) in our universe then it seems that a new dark sector particle is needed.14 An ‘unknown’ to explain the unknown—made-up stuff to resolve the contradictions between theory and observations; and yet, they are still in darkness. Hartnett., J.G., A Missing Neutrino—Dark Radiation, Answers Research Journal 7: 357–361, 2014. Hartnett, J.G. Big bang fudge factors, December 24, 2013; Hartnett, J.G., ‘Cosmology is not even astrophysics’, 2008. Hartnett, J.G., The largest structure in the observable universe or cosmic variance?, June 19, 2014. Hartnett, J.G., Dark Matter and the Standard Model of particle physics—a search in the ‘Dark’, September 24, 2014. The study of the origin of the universe. Modelling of the early big bang universe is compared to the power spectrum obtained from the small fluctuations in the CMB temperature from the uniform background temperature of about 2.725K. This required a certain matter content for the universe which was much larger than observed, hence the missing matter must be dark matter. A special class of supernovae which are used as a standard brightness (absolute luminosity) source to measure distance in the cosmos. When compared to the LCDM big bang model source these were dimmer than expected, and hence the inclusion of dark energy along with a good helping of dark matter. ΛCDM signifies the following: Λ the cosmological constant or dark energy and CDM Cold Dark Matter. There are many instances in the literature of where a dark particle is favoured for various combinations of models and data sets. See Fig.1 of Riemer-Sørensen, S., Parkinson, D., and Davis, T.M., What is half a neutrino? Reviewing cosmological constraints on neutrinos and dark radiation, Invited review for PASA, http://arxiv.org/pdf/1301.7102.pdf.